Ominous music, mist and fog of night and we see the parapets of Elsinore Castle above. Muffled cannons roar and a bell’s tolls in the night, mixed in with the orchestration. Hamlet comes part way down the parapet and sits and sings to the stars in a state of wonderment. It’s important to note that our boy Hamlet is very bright, but he is only 18 years old and this accounts for his sometimes rash behavior. He sings. in form and reason, how express and admirable. In action, how like a God. Yet, Man delights not me. The lights go off on him, and the lights come up on his friend Horatio, Hamlets school mate from Wittenberg who is standing below facing the audience. Look and hear the musing of this prince of Denmark. His goodly mind turned to conflicted thoughts. Returned he from bookish Whittenberg to find his world counter point to his going forth. His much beloved father, King... now dead. and his graceless uncle ruling in his stead. is now re-married to this inscrutable. over this twist in fortunes face. I saw it too or would not report it so. A musical thunder clap and lighting cut across the sky and the ghost of Hamlets father, the king in full armor stands up on the parapets with a spear in his hand. He is unsubstantial glowing but real enough. As he starts to sing one can assume he is in agony. Hamlet is standing below looking up at the apparition. Until the crimes I have done are purged away. Now is the time to say! Then revenge my foul and most un-natural MURDER! Slower tempo with tingling violins full of danger. Now wears the royal crown and frolics with his wife. poured poison in my ear whilst I did sleep. Robbing me of crown, of Queen, and eternal peace. that all do rightly dread! then in still greater fear the ghost sings. As for your Mother, do her no harm, my son. that will sting her well enough when all is done. I would not reveal of what we saw or said. Hamlet hold out his dagger. Swear upon this daggers hilt! of a cold and vaporous apparition. A father murdered, and a mother's honor stained. I will talk in riddles... and act insane! Unfit to wear great Denmark's royal crown! 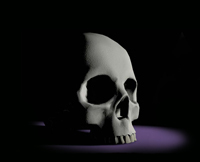 Hamlet by Gene Tyburn ©1996, all rights reserved.